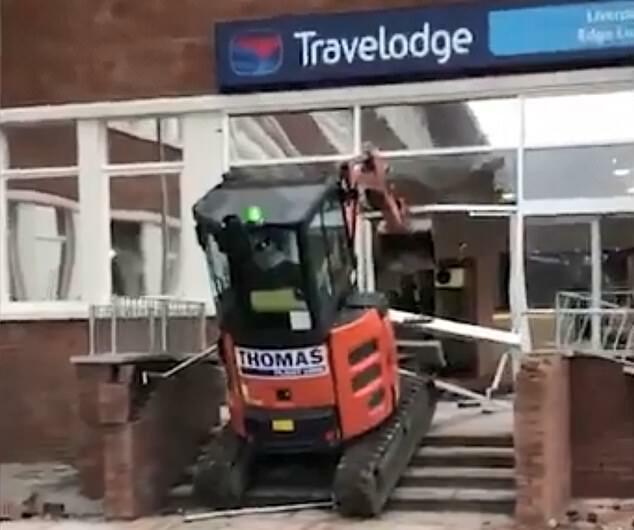 Police are hunting a digger drive who ploughed his 2.5-ton machine into a Travelodge in a row over an alleged £600 unpaid bill then fled scene of devastation on foot. 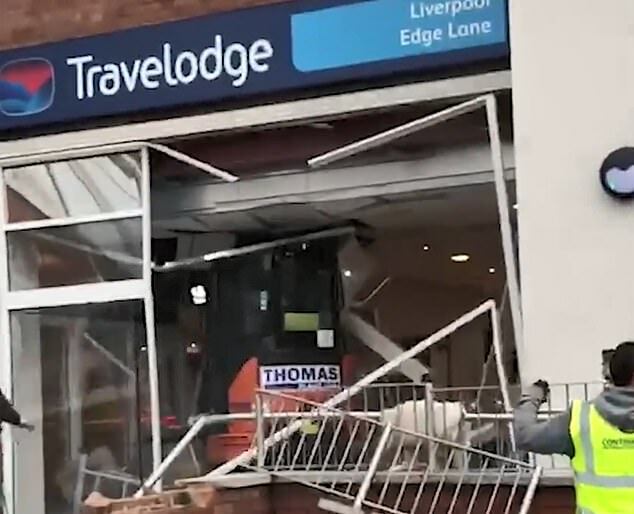 Footage shows the orange digger smashing into the half-completed hotel at Liverpool Innovation Park on Edge Lane shortly before 3pm yesterday. After getting up the steps leading to the entrance, the digger tears through the entrance and white parts of the doorway can be seen falling to the ground. A few seconds later, the digger rolls back out of the entrance and down the steps but the determined operator heads back up and through the front door. 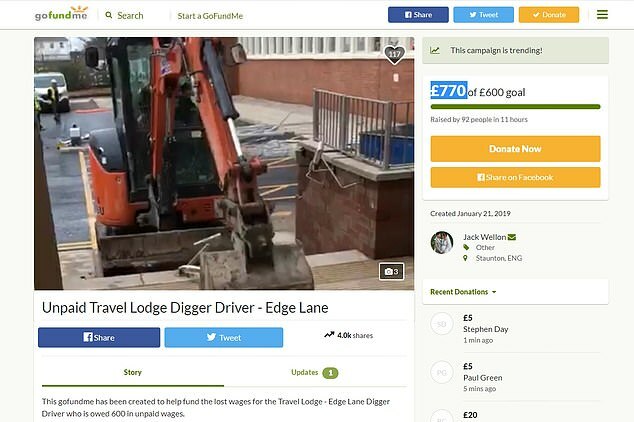 A GoFundMe page to cover the driver's 'lost wages' - and apparently also his legal bills - has now hit £760, with some commenters hailing him as a 'legend'. 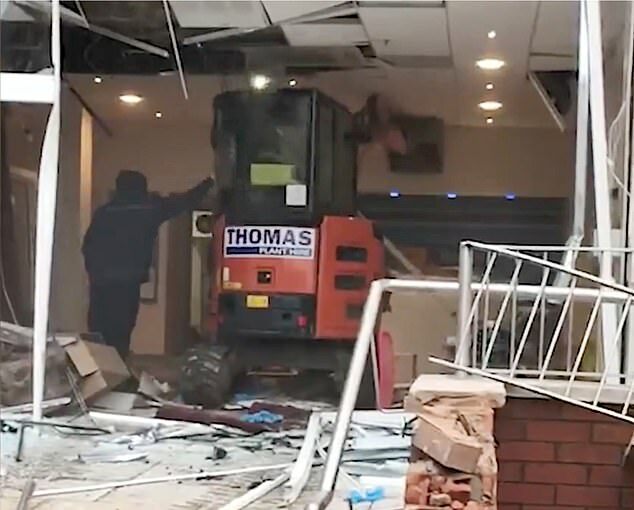 The arm of the digger is well inside the reception and the driver, thought to be called David, proceeds to crash into walls and the front desk. A number of workers can be seen cheering on the driver while videoing the incident on their phones - with others appearing to try to stop him. One person can be heard shouting on the footage, saying: 'That's what happens when people don't pay your wages, mate. 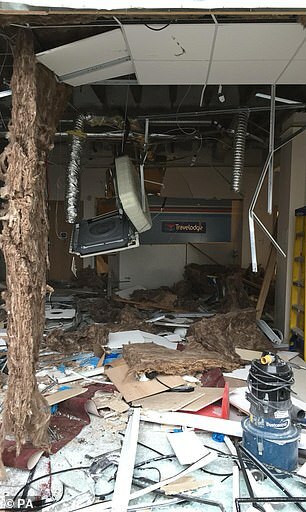 On the Travelodge website, the hotel is listed as 'opening soon', but the extensive damage could set back their plans. The driver of the digger was angry over a pay dispute said to involve £600, according to claims made on social media. Police were called to the scene but the digger driver had already left the vehicle and ran from the area, towards Edge Lane. In a statement, the force said: 'We are appealing for information after damage was caused to a hotel under construction in Liverpool. 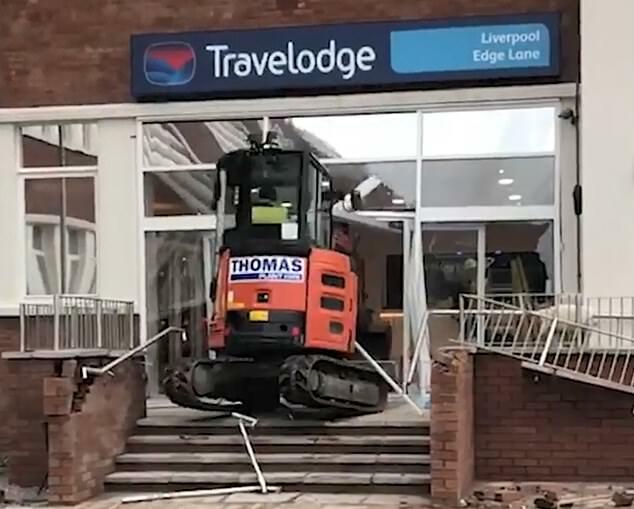 'A report was received shortly before 3pm that the digger was being driven into the entrance of the Travelodge building in the Liverpool Innovation Park. 'The driver then left the vehicle and made off on foot in the direction of Edge Lane. 'One man experienced eye irritation due to exposure to diesel and was treated at the scene by North West Ambulance Service. 'It is not believed anyone else was injured during the incident. 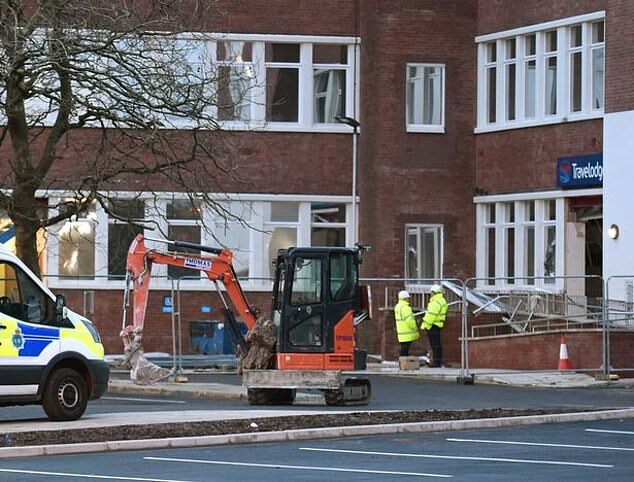 Pictures taken at the Travelodge show extensive damage caused to the building, including broken glass and fallen debris, with the digger still outside the hotel. Workers had erected metal fencing at the scene, around the destroyed hotel front, while officers carried out enquiries at the hotel. Thousands of people have now seen the footage on social media, with saying he was right to take drastic actions if he hasn't been paid. 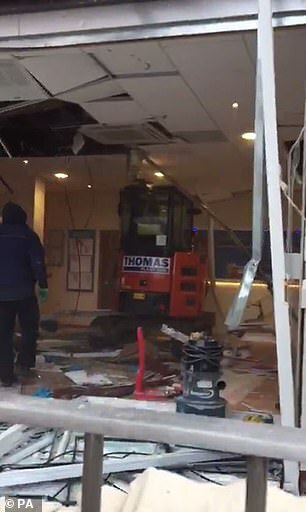 In another video taken from inside the hotel building the scale of the damage caused by the digger can be clearly seen. 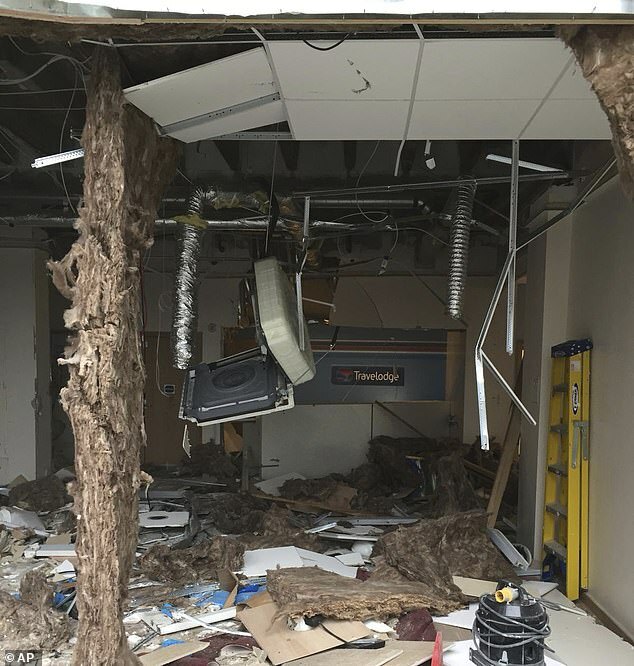 Parts of the ceilings are collapsed around the machinery, while walls and structural beams also appear to be affected by the vehicle. A number of other workers in high-vis jackets can be seen inside the hotel watching the carnage. One man even walks over to the digger and tries to reason with the driver. A spokesperson for Merseyside Police also confirmed that one man was treated by paramedics at the hotel. You can also call 101 quoting incident reference 19100021276 or contact the independent charity Crimestoppers anonymously. Travelodge declined to comment as the police investigation is ongoing. A spokesperson for Triton Construction, the main constructor on site, said there understanding is that a labourer who works for another groundwork constructor couldn't find his boss who was due to give him his wages. 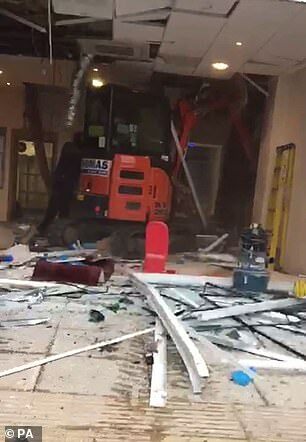 They said: 'At approximately 3.00pm the labourer took it upon himself to drive a small mini excavator through the entrance screen of the hotel and subsequently caused damage to finishes within the reception.